Around midnight on Friday, November 25 – several hours after the annual UN climate conference was scheduled to have ended – I stood in the hallway of a temporary conference center erected on the soccer pitch of the National Stadium in Warsaw, watching the scrum of the climate talks in their final hours. 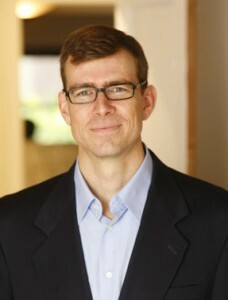 Nat Keohane is EDF’s Vice President for International Climate and a former economic adviser to the Obama administration. NGO representatives were pitching stories and sharing intelligence with reporters, negotiators were huddling in groups or dashing off to last-minute bilateral meetings, and everyone was scrounging for coffee or late-night sandwiches to power another all-nighter. The talks appeared on the brink of failure as countries deadlocked over the core questions of which countries should be obligated to reduce emissions and who should pay for it. In the end, as nearly always happens, an agreement was reached and the talks didn’t fall apart. That has become a typical pattern at these annual UN talks. If the scene was familiar, the headlines that came out of the talks were familiar as well: Developing Nations Stage Protest at Climate Talks (NY Times); UN presses rich nations to act on climate funds (FT); Modest deal breaks deadlock at UN climate talks (AP); UN talks limp towards global 2015 climate deal (Reuters); Climate Finance Battle Shows Expectation Gap at UN Talks (Bloomberg). But despite the dulling sense of déjà vu that Friday night in Warsaw, there was already reason for celebration. That’s because earlier that same evening – in a break with past years – the Conference of the Parties (or COP, as the talks are formally labeled) had already held the first part of its closing plenary to formally adopt decisions on areas in which negotiators could agree. During that session, the COP agreed on a comprehensive agreement on Reducing Emissions from Deforestation and forest Degradation (REDD+) – leading to what the UN, countries, media outlets and NGOs all identified as a bright spot in the negotiations. With deforestation responsible for about 15% of the world’s manmade greenhouse gas emissions – that’s more than all the cars and trucks in the world – we can’t solve climate change without saving our forests. REDD+ creates economic incentives to reward countries and jurisdictions that reduce emissions from deforestation and degradation below rigorously defined baselines. creating a structure for forest nations to share views on the effectiveness of REDD+ implementation. We had a foundation for the house; now we have the walls, the plumbing, the electricity and the roof for REDD+. On the issue of forest protection, at least, the UN talks did exactly what they are supposed to do: they reaffirmed work that had been done in previous years, built upon it in negotiating sessions held over the past twelve months, and made the final push to resolve key issues of disagreement in the two weeks of talks in Warsaw. This comprehensive package of decisions provides a structure for countries to develop REDD+ programs at a national level, and take advantage of the approximately $700 million per year already pledged for REDD+ program preparation and to pilot results-based payments. The REDD+ agreement also opens a path for the International Civil Aviation Organization and other bodies that are considering developing market-based mechanisms, whether multi-lateral, national or regional, to bring REDD+ into their systems with an imprimatur of a multilateral standard. Outside of REDD+, the talks were notable more for what didn’t happen than what did. The talks didn’t make significant progress, although they managed not to collapse. With two years until a new agreement is supposed to be reached in Paris, countries didn’t set a clear template for what they need to announce in terms of emissions reductions targets, or when they need to announce the targets. Nor did they make much progress on the key issue of climate finance – although surprisingly constructive talks on the difficult issue of compensating the world’s most vulnerable countries for the impacts of climate change reached a compromise agreement to create the Warsaw International Mechanism on Loss and Damage to address the issue going forward. On two important but lower-profile issues, there appeared to be signs of common ground behind closed doors – but these didn’t translate into movement in the formal negotiations. On the issue of agriculture, useful conversations occurred that could help integrate agriculture into a more holistic discussion of the role of the land sector in responding to climate change, even if no formal progress were made in the context of these negotiations. On the critical question of how to construct an international climate architecture that promotes and supports ambitious national action through carbon markets, countries put some useful options on the table – but could not reach a decision, instead deferring further discussion until next June. To be sure, we never expected much to happen at these Warsaw talks. They were always going to be more about headaches than headlines. But it’s hard to escape the sense that countries spent two weeks reopening issues that we thought had been resolved and fighting the same battles that have been fought before, only to make a last-minute lunge in the final hours to finish barely ahead of where they started. A good example is on the key question of participation. Since the 1992 UN Framework Convention on Climate Change, which listed the world’s advanced economies in an appendix or “annex,” the distinction between “Annex I” and “Non-Annex I” countries has been a central point of contention. Five years later, the Kyoto Protocol assigned emissions reductions only to “Annex I” countries. Eliminating the so-called “Kyoto firewall” has been a red line of the U.S. and other advanced economies, which point to the rapid growth in major emerging economies such as China and India, and the concomitant rise in their greenhouse gas emissions. In 2011, at the UN talks in Durban, South Africa, countries declared that a new agreement, to be finalized in Paris in 2015, would be “applicable to all Parties” – a phrase widely understood to mean that the Annex I/Non-Annex I distinction would be erased. But the first draft of the negotiating text in Warsaw hardly referred to Durban and instead used the different term “broad participation.” That opening salvo didn’t last, and the final text reaffirmed the Durban agreement – but not before significant energy had gone into re-fighting that battle. With little to show for their two weeks of long days and all-nighters, negotiators have left themselves a lot to do over the next two years to reach a meaningful outcome in Paris. However, countries and other actors don’t need to wait for an international agreement in 2015 to start addressing climate change. It was clear, through events on the sidelines of the negotiations and conversations with other attendees at the conference, that cities, states, countries and regions around the world have already started moving to cut their emissions and adapt to climate change. Some of the most interesting side events highlighted the progress made in China on provincial carbon trading pilots and explored how the Chinese experiments could learn from California’s experience in building a successful carbon market. And the Climate and Clean Air Coalition – a group of more than 70 state and nonstate partners working together to reduce short-lived super-pollutants like methane, black carbon, and HFCs – also announced important progress. Those side events were a reminder that the UN talks, while they remain important, are not the only game in town. That’s a good thing, and a reason for optimism. Because with the damaging impacts of climate change already apparent in the United States and around the world, the world urgently needs near-term action to turn the corner on global emissions and put us on a downward trajectory toward climate safety. Read EDF’s press release on the outcome of the Warsaw negotiations: Strong agreement to protect forests highlight of UN climate talks. But while the delegates are gathering in Poland — and their hearts are with the Philippines — their minds will be 850 miles to the west, in Paris. That’s because in two years’ time, the same set of countries will meet there to conclude a new global agreement to fight climate change, intended to take effect from 2020. 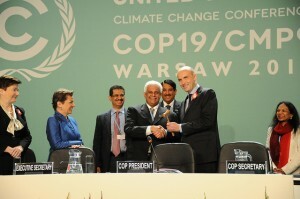 As a result, even as delegates in Warsaw continue to work on individual issues – such as how to support policies that reduce emissions from deforestation, and how to finance work that reduces greenhouse gas emissions — they are also beginning to grapple with how to knit those components together in an overarching agreement. No major breakthroughs are expected this year, but many nations have expressed the desire to develop a skeletal framework and flesh out a coherent design for the 2015 agreement. Their challenge: How to invite broad participation, while simultaneously encouraging ambitious emissions cuts? The answer may be to seek a middle ground between what are sometimes called the “top-down” and “bottom-up” approaches. The top-down approach envisions a sweeping agreement that would allocate the allowable “carbon budget” among countries and create a comprehensive system to implement it. Solving the problem in a single go would be great for the climate. But that approach doesn’t mesh with the political realities of tackling the climate issue in an arena with 190+ different nations, each with its own energy mix and development priorities. Those realities came into sharp relief four years ago in Copenhagen, where grand hopes of a “global deal” ran into the reality of a UN process better suited to incremental progress. At the other extreme, a purely “bottom-up” approach may appear more realistic, but risks achieving little. Without any framework in place to encourage countries to undertake ambitious actions, to verify that they are abiding by commitments they have made, or to provide them with the tools they need to carry them out, it is unlikely that their pledges will add up to anything remotely ambitious enough to solve the problem, or that their pledges will be implemented. A middle road is needed: a path between “top down” and “bottom up,” and an approach that recognizes that while the UN can’t solve the problem at one blow, it has a key role to play in supporting and promoting effective action by countries. The key to this approach is constructing a legal framework, or “architecture,” that provides a home for a range of different national approaches while ensuring market integrity and encouraging ambition. In Warsaw, an important portion of the discussion about the architecture of the 2015 agreement will play out in a track known as the “framework for various approaches,” established in Durban in 2011. Created as a forum for exploring both market and non-market approaches for reducing emissions, the “FVA” offers an important opportunity to set guidelines for the design of effective, high-integrity national programs. As a result, it provides an opening to chart the middle path. A sound climate architecture should give countries the confidence to take on and implement ambitious targets. It can do that by ensuring rigorous and transparent monitoring and reporting — so that countries can verify that other nations are following through on their own commitments. An architecture should create incentives for early action, even before a new agreement takes effect from 2020. An architecture should also establish minimum guidelines or standards for the integrity of domestic programs, enabling countries to evaluate each other’s actions. Such an approach would also have the effect of facilitating environmentally sound linkages between and among those nations with existing and emerging carbon markets. This kind of architecture could then become a “gift that keeps on giving,” as it would reinforce nations’ willingness to undertake even more ambitious targets in the future, secure in the knowledge that their negotiating partners are also undertaking and implementing their commitments. Flexibility in how nations might participate in a new agreement, recognizing that some nations may not be able to ratify internationally binding elements of any final 2015 deal. Our policy brief, A Home for All: Architecture of a future global framework for mitigation action [PDF], has more details. 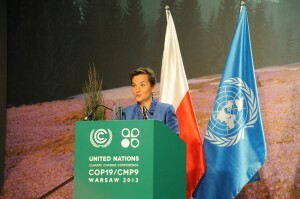 Although nations are unlikely to define the content and structure for the 2015 agreement at this level of specificity by the close of the Warsaw meeting, we hope countries can agree on a clear blueprint for the next phase of work that incorporates these “minimum pillars” of transparency and environmental efficacy. The Warsaw meetings are unlikely to generate much front-page news. But behind the scenes, the talks can play an important role in preparing the ground for Paris. The key task is to lay the foundation for a durable and dynamic legal architecture that accommodates real-world constraints, while refusing to accept a lack of ambition: an architecture that provides a home for all nations to contribute to addressing the shared global challenge of climate change. As the impacts of warming temperatures and rising seas become ever more apparent around the globe, the need for such an architecture becomes all the more urgent. Countries meeting in Warsaw for the annual United Nations climate conference won’t finalize the structure of an international agreement to address climate change, but they should make progress on some important topics that will serve as the foundation for such an agreement. Over the next two weeks, more than 190 countries will be working on topics that constitute the nuts and bolts of an international climate agreement, such as how to support policies that reduce emissions from deforestation (REDD+), and how to finance work that reduces greenhouse gas emissions. Countries at the 19th Conference of the Parties to the United Nations Framework Convention on Climate Change — or “COP 19” — also face the broader issue of how to knit these topics together in an overarching agreement, set to be finalized at the 2015 negotiations in Paris. The 2015 agreement’s structure, or framework, will be an important area for discussion in Poland. Negotiators in Warsaw need to clear out the brush so they can see a path to resolving major issues on the road to Paris. Warsaw is unlikely to generate front-page headlines – but below the surface, there is considerable potential to make real progress on key foundational issues. This is the year for negotiators to get their hands dirty and prepare the ground for an effective framework in 2015 – one that encourages countries to take ambitious emissions cuts and invites all countries to participate.